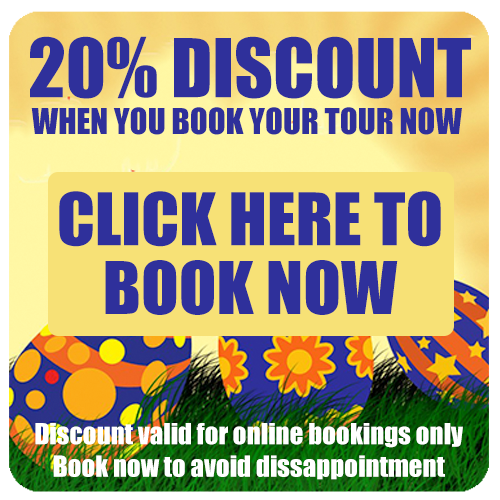 The Safari Ostrich Farm guided tour includes the chance to encounter not only the local South African breed but also the Kenyan Red and Zimbabwe Blue Ostriches. 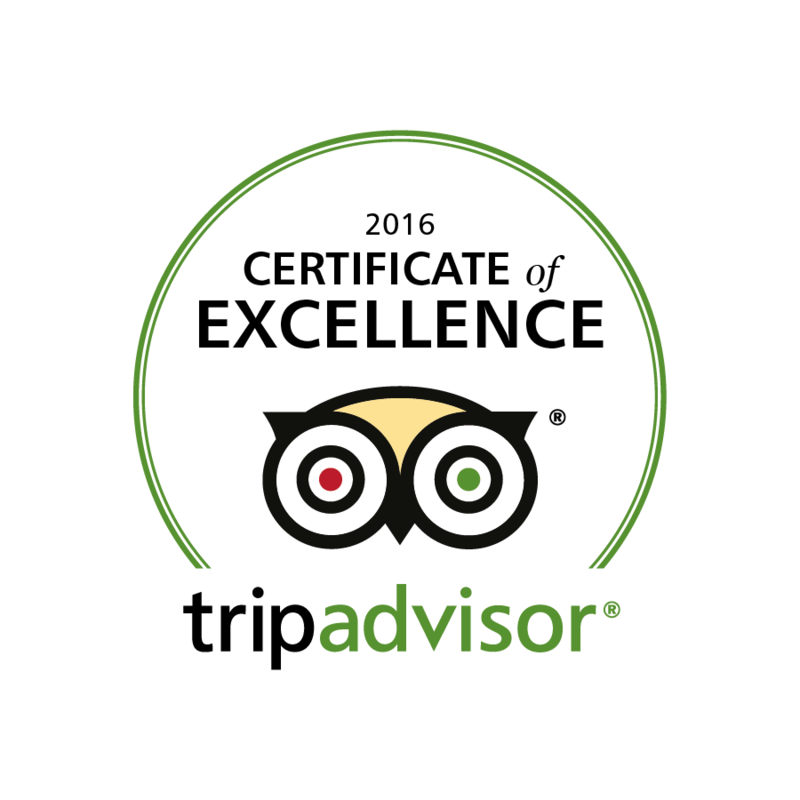 We will also show you the second biggest bird in the world after the ostrich, namely the Emu from Australia and our rare White Ostriches. Farmers in the Klein Karoo farm with the Oudtshoorn ostrich (Struthio camelus domesticus), or the South African Black as it is frequently referred to. 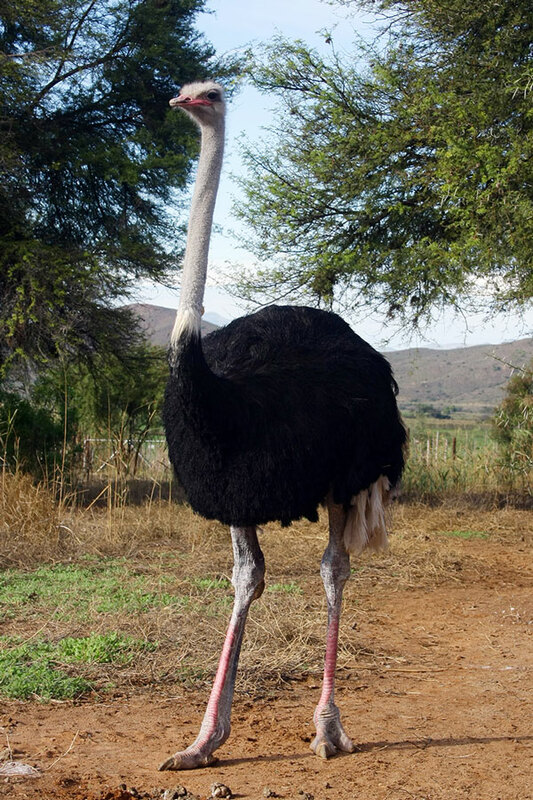 The South African government and local ostrich farmers from Oudtshoorn launched a cross-breeding programme in the early 1900s and cross bred the ostriches from North Africa and East Africa to get what today is known as the South African Black Ostrich. They did this to achieve higher quality plumage for the international feather market and an ostrich with a docile nature. The South African Black or Oudtshoorn ostrich is thanks to the farmers of the Klein Karoo the most well-known of the different subspecies. 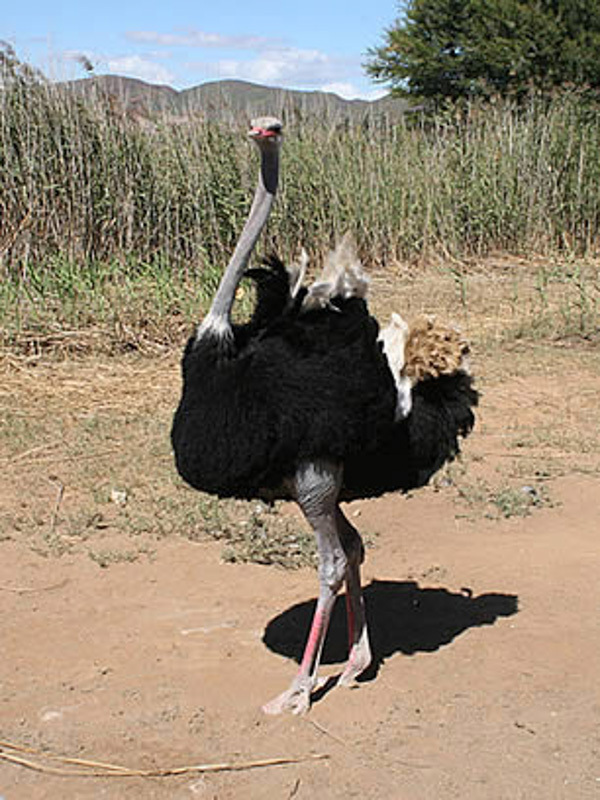 There are different ostrich types of which the Zimbabwe Ostrich is the tallest. They can easily reach a height of 2.7 metres and a body mass of 140 kg. The upper legs of the male are blueish grey therefore they are called the Zimbabwe Blues. The feather quality however is poorer compared to our ostriches. Even the meat is of a poor quality because they are more aggressive and therefore it has more acid. The farmers focus mainly on the South African Black because by far they have the best fertility, meat and feather quality and want to guard that genetic material for as long as they can. The White Ostrich (Struthio camelus) is actually a member of the South African Black bloodline. 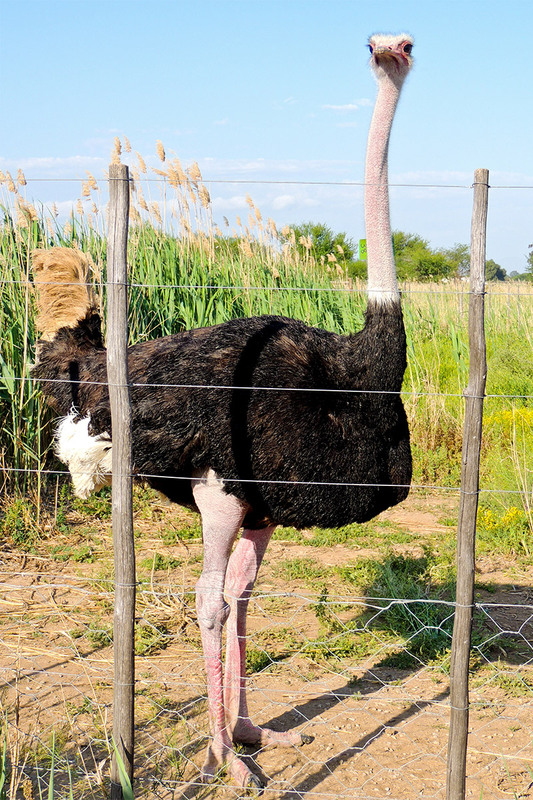 These beautiful ostriches are very rare – so much so that only one in about 20 000 ostriches will look like this. Disticntive features of the White ostrich is that they have a white neck and head and the majority of their feathers are white. The feathers are generally of a poor quality though. They are also as a rule smalller and shorter thant the S.A. Black ostriches because their distinctive appearance is due to a recessive gene. They are about 2 meters tall and weigh approximately 110 kg. You will not find white ostriches in the wild since as little white chicks they will stand out to predators who will take them out. A male and female White Ostrich will also not necessaraly produce white chicks as offspring. 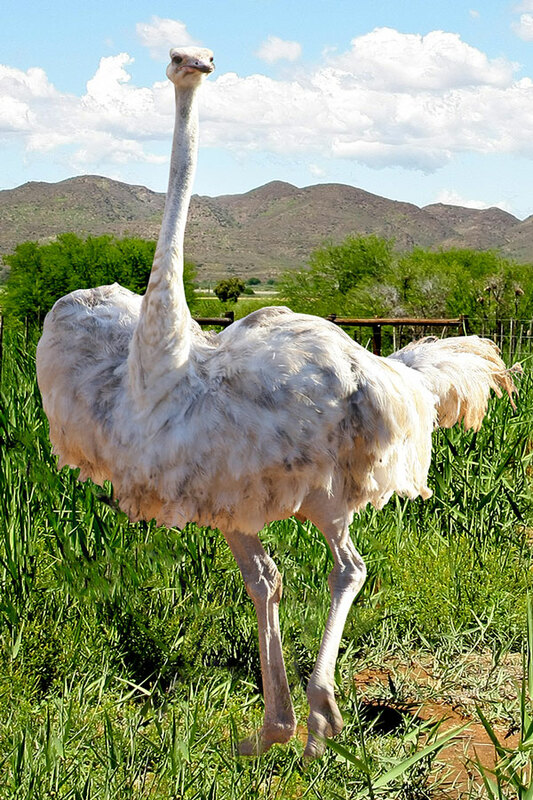 We at Safari Ostrich Farm has managed to get 5 White ostriches over the last 20 years form other farmers in our region. The entire body of the male is red in colour hence the red ostrich. It is the heaviest of the species weighing in at 160 kg and grows over 2 metres tall. The same as the Zimbabwe bird the feather quality is very poor. The Kenyan male is definitely the most aggressive and bad tempered of the species. The emu is the second largest of the Ratitae Family. Compared to the ostrich it has three toes. The defence is a dangerous kick too. The female is the most dominant and makes a distinct drumming sound. Females tend to be larger than males but the male is the only one who incubates the eggs for 54 days vs. ostriches 42 days. The eggs are dark green in colour. Ostriches can be traced as far back as 40 to 60 million years, along the Mediterranean Sea in the west and China in the east and Mongolia in the north. The Ostrich migrated south across Africa approximately a million years ago, together with many of the larger mammals. Wild Ostriches were to be found throughout the entire continent of Africa. At the time of the landing of Jan van Riebeeck at the Cape in the 1652, large flocks were seen in the Western Cape. Ostrich farming began by capturing wild chicks and hatching eggs from the nest of wild birds, by incubation. Before long all the birds in the area had been domesticated and as farmers were fully aware of the lucrative return from the feathers, they sought stock further afield. It was common practice at this time to trek into the Karoo and the Eastern Cape in search of Ostrich chicks and eggs. The farmers of Oudtshoorn were the pioneers of the ostrich industry, which commenced in the Oudtshoorn district during the middle of the 19th Century and therefore Oudtshoorn became known as the Ostrich Capital of the World. When the farmers discovered Lucerne as ideal fodder for ostriches, they established some of the first Lucerne fields in the country, in Oudtshoorn. Our area having brackish, slightly saline soil and plentiful irrigation from the Grobbelaar’s and Olifants Rivers to allow for cultivation of lush Lucerne fields and with a dry climate and periodic droughts with scrubby Karoo Veld it was almost identical to the ostrich’s original habitat. Ostrich feathers were exported from South Africa as early as 1859 and it’s interesting to note that during the ten years preceding 1914, Ostrich Feathers ranked fourth to gold, wool and diamonds in the value of exports from South Africa. During this feather boom there was more than, 77 600 ostriches on farms in the country and in 1914 there was close to a million ostriches. Then overnight the industry collapsed; the worldwide socio-economic effects of World War 1 caused this. Safari Ostrich Show Farm, is the first show farm in South Africa where the Kenyan Red and Zimbabwe Blue ostriches as well as the local South African breed can be viewed.